Those of you who follow my ramblings on Facebook are already aware that the first Monster Squad book, Return of the Phoenix, has been included in a truly awesome boxed set along with five other authors. Whoever decides to take advantage of this offer will be picking up over a half million written words of some of the best horror on the market. For those of you who haven’t already experienced the wit and wisdom of Mark Tufo, here’s your chance to dive into the first of his Zombie Fallout series. You also get to sink your teeth into John O’Brien and the first of his zombie series, Chaos. Expose yourself to the inner workings of the twisted mind of Armand Rosamilia with Darlene Bobich: Zombie Killer. You can dive into Trudge from Shawn Chesser, probably one of his best works. And one of my personal favorites is James Cook’s offering of No Easy Hope. These are all full length works to keep you busy through the Halloween season…but there’s a catch. We’ve included a teaser from Joe McKinney’s The Dead Wait. If you’ve never read Joe’s writings, you’re not doing yourself any favors. He has a way of sucking the reader into the story and putting you on edge throughout the entire ordeal. Now for the ‘spiel’. You get the entire boxed set for the price of a single e-book. WHY would we do this, you might ask? Where’s the catch? Are we only putting in HALF the story? No, these are the complete first books. If you ordered each of the books off of Amazon, this is what you’d get. The catch is, we’re trying to EXPOSE all of these writers to YOU the reading public. That’s why we make offers like this. You may recall a while back when I mentioned that I ‘fell into’ a wonderful situation with a group of other authors that help promote each others work…this is that group. A mish-mash of authors from all over the country with one thing in mind…to put our stories into the hands of as many readers as we can. 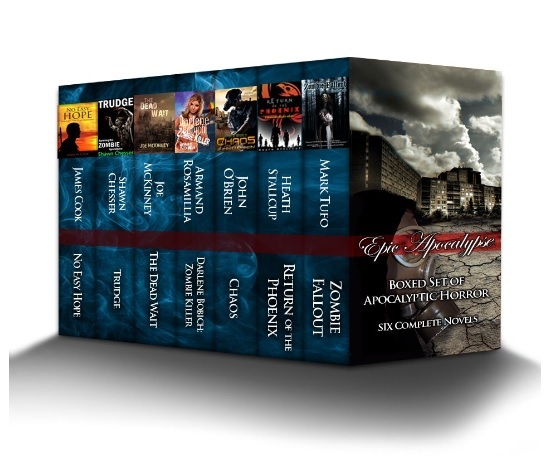 So, with that, I present to you, the readers, Epic Apocalypse, A Boxed Set of Apocalyptic Horror.